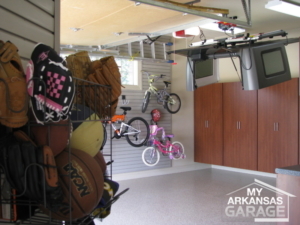 You keep cars in your garage, but it also serves as a workshop, a long-term storage space, and home to your tools and sports gear. We carry the largest assortment of accessories in Arkansas to fit your ever changing lifestyle. 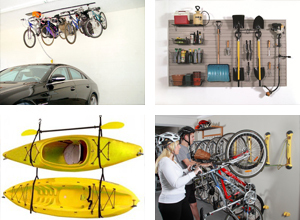 Whether you need storage solutions, wall accessories or overhead storage in your garage, we can help you design the best solution. Our modular wall system is a storage and organizational solution utilizing a very strong cellular PVC slatwall. The slatwall is screwed directly over existing sheetrock or exposed studs. We offer a large selection of accessories that are designed to be used with this system. The accessories include a variety of recycle bins, shelves, bins, hooks and baskets. The accessories simply hook onto the slatwall. The accessories can be moved up and down or side to side on the wall with ease. Our slatwall system offers the utmost in organization and space efficiency.